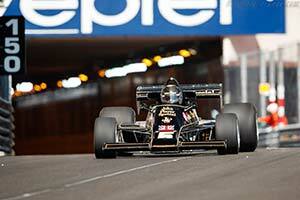 Team Lotus had a hard act to follow after racing the successful and ground-breaking Type 49 and 72 Grand Prix cars. The latter's first successor was the Type 76 introduced in 1974. Fitted with a bi-plane wing, a button operated clutch, a pair of brake pedals and rising-rate suspension, it proved so difficult to drive that the Team Lotus pilots reverted back to the Type 72 for 1974 and 1975. Keen not to make the same mistake again, Team Lotus developed a far more conventional car for the 1976 season. This Type 77 was built around a narrow monocoque that used the Cosworth DFV V8 and Hewland five-speed gearbox as fully stressed members. To aid traction, much of the weight was concentrated over the rear wheels by mounting the radiators in small side-pods on either side of the engine. A small oil cooler was fitted in the nose of the Type 77. The Type 77 would not be a Colin Chapman creation if it did not have at least one trick up its sleeve. The trick this time was fully adjustable suspension that allowed both the track and the wheelbase of the car to be altered to suit both sweeping, high-speed track and the tighter street circuits. At the rear, the twin brake callipers also served as the suspension mounts. A pair of Type 77s were ready in time for the 1976 season opener. The car did not prove to be an instant success and after an early retirement, lead-driver Ronnie Peterson decided to leave the team and race for March instead. This left Team Lotus with the young and inexperienced Gunnar Nillsson and Bob Evans until Mario Andretti returned to the team full time to race the Type 77 alongside Nillsson from the spring of 1977. It was a timely arrival as the Type 77 had been considerably improved. Nilsson finished second in Spain, while Andretti lead most of the Swedish Grand Prix until his engine exploded. There was success at last when Andretti won the horrendously wet Japanese Grand Prix. It was the first Grand Prix victory for Team Lotus since 1974. As it turned out, the relatively conventional Type 77 was in fact an interim car as it was replaced for the 1977 season by the groundbreaking Type 78, which brought ground-effect aerodynamics to Grand Prix racing. Returning Lotus to the winner's circle, the Type 77 did show the world that the British team was still capable of producing successful Grand Prix cars.